Series can hinge on the slimmest of margins, but rarely can you see those margins so starkly as in Monday’s Game 3. It is no overstatement to say that the Golden Knights are up 2-1 in their series with the Sharks because of an inch here, an inch there. 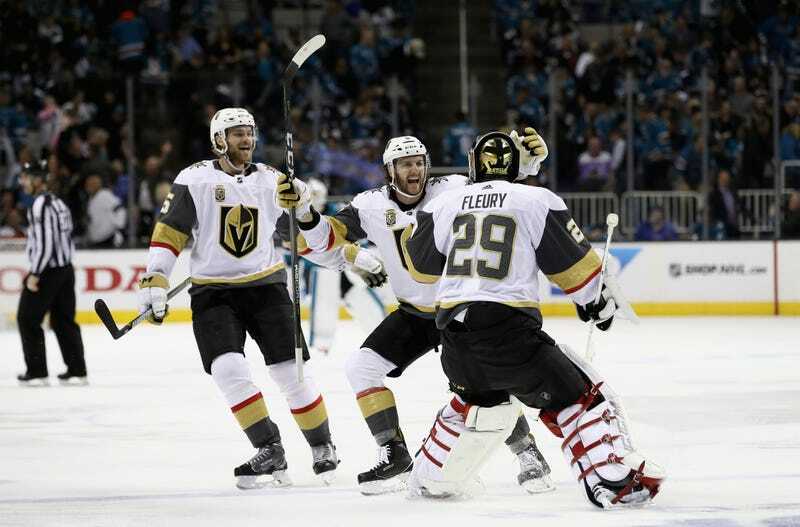 Marc-Andre Fleury, who is and has been the backbone of this team, made 39 saves, none better than his glove snag of Logan Couture’s shot three minutes and change into overtime. I know these things are self-fulfilling, because any team that goes deep into the playoffs is necessarily going to have unbelievable saves like this, but this is the sort of save in the sort of moment that outright wins games and swings series. Of all his goals—43 in the regular season, five more in the playoffs, Karlsson said of this one, “it’s probably the nicest one.” The context probably helps. Despite the obvious skill involved with these two plays, there’s a necessary element of flukiness—the game of inches. A couple more inches and Fleury doesn’t nab that shot, and San Jose is in command of the series. Or, another inch higher and Karlsson’s shot rings out, and who knows what happens after that. Luck, and skill. No team has ever won without both.